This is an annual event, but the date and the title of this year's event is haunting. 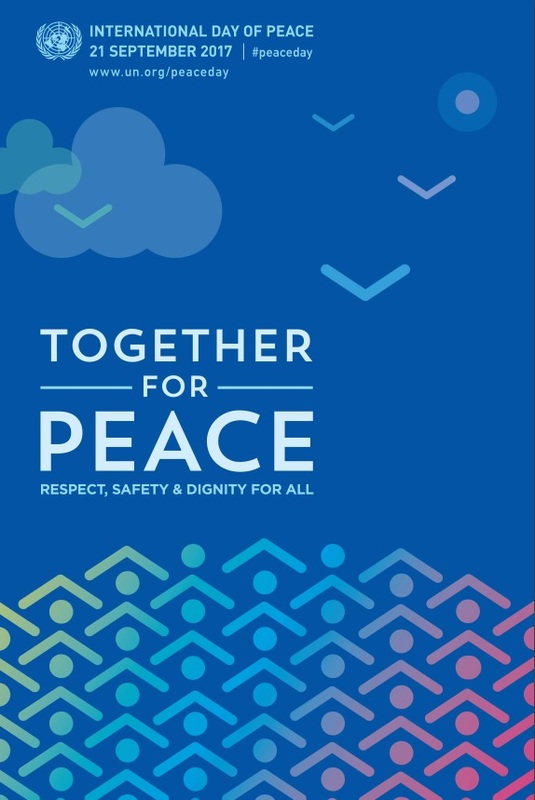 The International Day of Peace, also known as "World Peace Day", has been celebrated on September 21st since 2001. 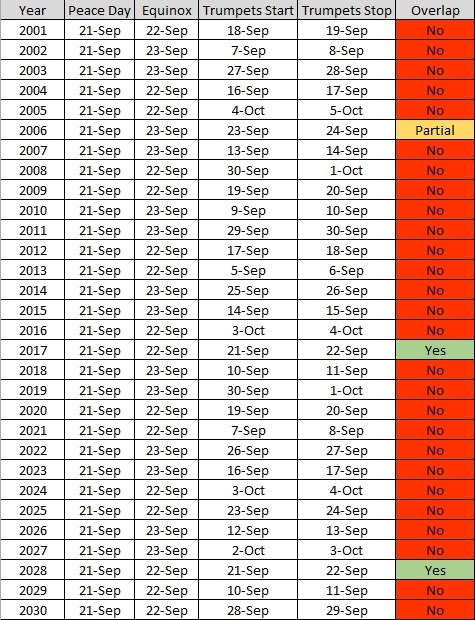 I did a little digging and discovered that only two times in a thirty year span (2001 - 2030) did World Peace Day fall on the same day as the Feast of Trumpets... 2028 and 2017. If 1 Thessalonians 5:3 has anything to do with the rapture, it's interesting that this year people literally could be saying "Peace and safety" right when the rapture occurs. Just speculating here. It's like watching the movie after having read the Book. Just watching all of the details that are appearing...some of this stuff is just amazing. You couldn't make this stuff up! I see some flying up into the clouds and others covering their heads... interesting. Daniel Matson also posted a piece on this last month. Can't imagine how on the edge of our seats we will be around the beginning of September! John Kerry and Benyamin Netanyahu have both used the phrase "Peace and Security" during their exchanges just before DJT was inaugurated. They were talking about the need for it. Also interesting is The Trump / Abbas meeting at the White House a few days ago produced some stunning words and phrases right out of prophecy (which of course they were not even aware of.) President Trump spoke of his desire to “facilitate a final peace agreement between the Palestinians and Israel in which peace and safety would be the result”. The 4 horsemen of the apocalypse are about to be let loose. Has anyone considered Pentecost? I read several articles this morning that make the case for Pentecost being the "season". Reading through Lev 23, it is clear that Pentecost (shavuot) is a harvest feast. I know the traditional view is that this feast was fulfilled by the Spirit being poured out in the church, but there are some clear correlations....anyway, just ready to go I guess. It seems like a case could be made for Pentecost Rapture as well. This is a good study from Luis Vega. Agreed! Love your site btw. I'm not the 'Gary' that operates the site. LOL! I just try to chime in from time to time. THE 'Gary' does have a terrific ministry here though, and is doing much to keep us all on our spiritual toes. Hello Lance. I'm very interested in the significance of the Hebrew Feasts, and also the way they are tied into the Birth, life, death, resurrection of Christ and the rapture. 2 reasons why I don't think it can be a Pentecost rapture. 1. All of the first four Spring feasts have already been fulfilled in Christ. Chronologically they are Passover, Feast of Unleavened bread, First Fruits and Pentecost. That leaves the 3 Fall feasts, which have not been fulfilled, - the very next one on the calendar and chronologically is FOT. 2. and the strongest reason it doesn't work is that the "Last Trumpet" is a direct and unmistakable reference to Yom Teruah, and also a direct reference to the rapture. Also, the phrase "No one knows the day or the hour" is another direct and explicitly clear phrase that is unmistakably linked to Yom Teruah - FOT. Christ/Paul would not tell Christians to watch and be alert for the signs, and give us 2 clear, false signs. Both "the Last Trumpet"and No one knows the day or hour" confirm / support the notion that the rapture most fits Yom Teruah. Blessings. Maranatha. Loren O.
Elul (August 24th-September 20th) is the last month of the Jewish year, also considered the month of Divine Mercy and Forgiveness by observant Jews. Chassidic master Rabbi Schneur Zalman of Liadi likens the month of Elul to a time when "the king is in the field" and, in contrast to when he is in the royal palace, "everyone who so desires is permitted to meet him, and he receives them all with a cheerful countenance and shows a smiling face to them all." Rosh Hashana marks the beginning of the Jewish New Year. Interestingly, the Shofar is blown every day of Elul (as a call to repentance), except for the last day of the month (September 20th). So on September 19th of this year, the Shofar will be blown for the last time before the Jewish New Year. Could this be the last trump spoken about in 1 Corinthians 15? Blessed be YHWH and those who believe in Yeshua! It just gets more and more amazing, excited to meet you all in the air! we are a week away from this. 21 sep 17 is very close. i guess either it happens or it does not.